Home / Main Index, Biographical Index, Surname Index . William Jasper Dunnuck was born in Idaville, Indiana October 22, 1860 and departed this life at his home in Wymore, Nebraska, September 14, 1923, aged 62 yrs.,10 mos., and 23 days. He came with his parents to Kansas in 1866 residing in different sections of the state until he moved to Wymore in the fall of 1922. He was married to Isabelle Callendar, January 23, 1884 and to this union were born three children -- Leslie, Stella and Etta. Leslie died at the age of 7 yrs. 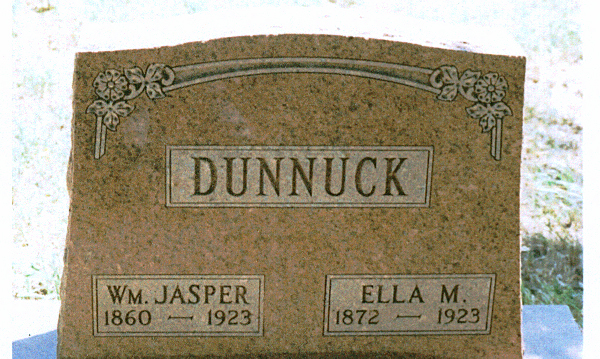 Mrs. Dunnuck died April 27, 1890. He was united in marriage to Rilda Chipman July 1, 1891 and to them were born four children -- Merle, and William dying in infancy and Clair and Adair still at home, were a great comfort and help to their father during his long illness. He was elected sheriff of Cloud County in 1908 and reelected in 1910. Will was a kind and affectionate husband and father; a good citizen and a friend to all and will be greatly missed. He leaves to mourn his loss his wife and two sons; two daughters, Mrs. Ansdell and Mrs. Boofer; 4 grandchildren; one half brother; two brothers and 2 sisters; and a host of other relatives and friends. He was a member of the Methodist Church of Washington; also a member of the M.W.A. (Modern Woodmen of America) and R.N.A. (Royal Neighbors of America lodges. Short funeral services were held at his home on Sunday afternoon at (?) o'clock after which the remains were brought to Spence, KS where services were conducted by the M.W.A. Lodge of Washington assisted by his pastor, Rev. Endicott: he was laid to rest in the Dunnuck private Cemetery at Spence. Mrs. William J. Dunnuck, sixty three years old, resident of Wymore for the past three years, former resident of Washington, Kansas for thirty years, died Monday monday morning at the home of a neice in St. Louis, (MO) where she had gone four days ago for a visit, and the body is being shipped to Wymore where it will be taken by auto hearse to the private Dunnick cemetery on the old homestead near Washington, (KS) for burial beside the husband who died at Wymore on September 15. Two sons, Claire of Omaha and Earl of Wymore and two daughters, one in northern Nebraska and one in eastern Missouri, survive.